Hello! Sorry for neglecting these posts in recent times. We’ve actually been in the studio during the summer, recording another album at Soup Studios. We’re working in bits and pieces, as is our way. We stop and think about things, then try something different, then keep working, then stop and think about things a little again. It’s going incredibly well. At the moment we are thinking of calling this album We Come from the Same Place. It seems to encapsulate everything that’s been going on around these parts for the last 8 months or so. Anyway! It will be a long time until it comes out, as seems to be the way. But we have learned to be patient with these things. Tomorrow we are heading to the End of the Road festival. We think that we might be playing to our biggest audience ever, which is exciting/terrifying. We are working out the setlist this afternoon, and doing some last minute rehearsal. We can’t wait, really. On Tuesday Elizabeth recorded four songs with Darren Hayman at his home, and she has posted the songs up on bandcamp. The EP is called Optimism, and features songs written on piano and guitar, and was recorded completely live. You can listen and download the EP here. We have also got some new shows coming up in the UK in October. We will be stopping in Leeds, Manchester and London. The details are all over on our shows page. We are doing another Marc Riley session around that time too. This entry was posted in Uncategorized on 29 Aug 2013 by Allo Darlin'. Our London Compass shows go on sale today. We’re playing a show in every corner of this fair city of ours, in preparation for recording our new album in the summer. We’ll be playing four venues we’ve never played before – an ancient church, a jazz venue, a classic South London boozer and a converted Victorian WC in West London. It will be only our second time playing in West London. Crazy! We’ve got some great support lined up too – the magnificent Haiku Salut and exciting upstarts Flowers. As well as some very special guests too big to announce. We’ll mostly be playing songs that we will be recording for the new album, but of course we’ll include some old songs too. TIcket links are up on the shows page. This entry was posted in Uncategorized on 1 May 2013 by Allo Darlin'. Oh my, I have been rubbish at updating this website, haven’t I? Sorry folks. Well we have been busy working on new songs, and perhaps you’ll be pleased to know that we are planning to record our new album this summer in London once again at Soup Studios. We are also planning four London shows to road test the new tunes. We will of course let you know where and when, but the idea is one in each corner of London, and the shows will be small. In the meantime, we have the odd festival appearance coming up. We are headlining Wales Goes Pop in March and also the Now We Are! Weekender in West Brom, both in the Spring. We will also be playing some festivals in Spain, some of which have been announced and are listed on the shows page. There will be other festival appearances too, which will all be announced in due time. We had a great time in Manchester last week playing a session for Marc Riley, where we premiered a new song “Bright Eyes”, featuring Paul singing too! That session is still up on iPlayer, if you wanted to have a listen. It’s pretty rocking! That’s all that’s going on for now, I will try to be better at updating this website. We are going to build a new one soon, and hopefully that will makes things easier for everyone. We are better on Twitter. This entry was posted in Uncategorized on 6 Feb 2013 by Allo Darlin'. European tour starts this week! We start in Spain with the Wave Pictures, then make our way to France, Switzerland and Germany. Norway’s Making Marks will be joining us for some of the French and German shows, which will be a real treat. It will be nice to take Europe back to where it started. Let’s hope the van doesn’t break. This entry was posted in Uncategorized on 29 Oct 2012 by Allo Darlin'. Well, that’s the end of our English tour. Thanks so much to everyone who came out, all of the bands who supported us, and all of the promoters for having us. It was awesome to spend some time getting to know this little country better and to meet so many people doing great things in their towns. Our next tour will be in Australia, and we’ve just added another date in Armidale. All of the shows will be with Monnone Alone, that’s Mark from the Lucksmiths for the uninitiated. Our Sydney show is free, and tickets for the Melbourne and Brisbane shows are both up on the shows page. It means a lot to us to go back home and play shows, and we’d love to get the word out to as many people as we can. So please, help us spread the word! Paul has once again made us a beautiful poster. Based on Stockman’s Corner, Rockhampton. This entry was posted in Uncategorized on 14 Sep 2012 by Allo Darlin'. We’ve picked up the van, we’ve got our beautiful new tees, and we’re ready to hit the road tomorrow. All of the details for the English tour are on the shows page. This entry was posted in Uncategorized on 30 Aug 2012 by Allo Darlin'. Afternoon! We’ve just confirmed a bunch of shows on the Continent, and very excitingly, in Australia! We’ll be on the road for most of the Autumn. 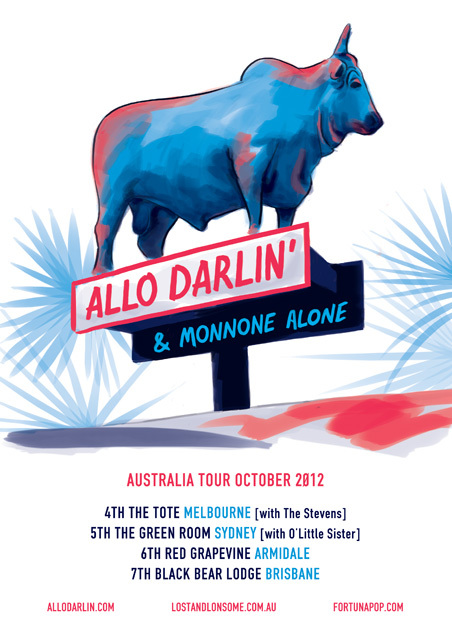 In Australia we’ll be touring with the wonderful Monnone Alone (ex-Lucksmiths) and heading up the East Coast across 4 days in October. Stay tuned for more Continental shows to be announced, we know there’s a few places we’ve missed. Details for all these shows are over on our shows page. This entry was posted in Uncategorized on 26 Jul 2012 by Allo Darlin'.